Offered here is a beautiful vintage original 11x14 in. 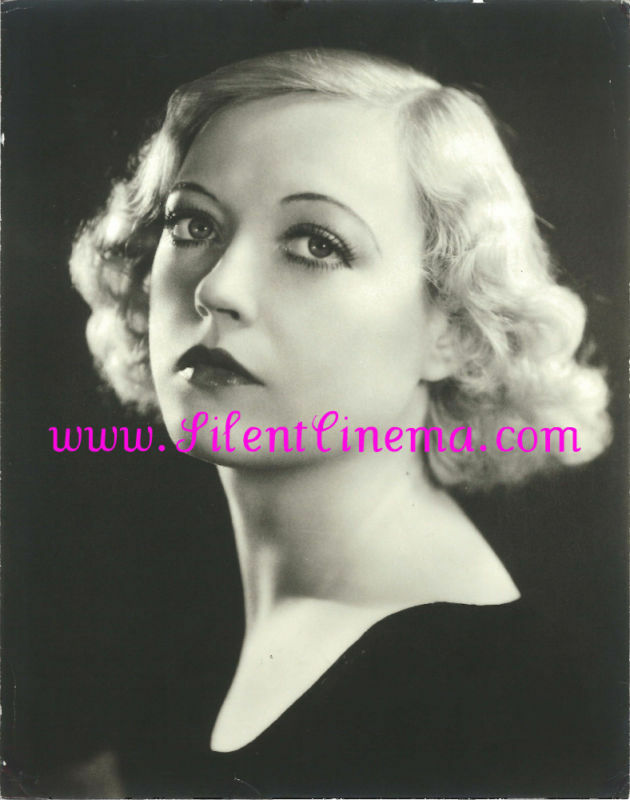 U.S. double-weight portrait still photograph of the beloved film actress and former Ziegfeld star MARION DAVIES. The image depicts a close shot of Miss Davies wearing a black dress and photographed against a jet black background. The strong side-lighting adds contrast and compliments this gorgeous image. Measuring 11x14 in., this vintage original still photograph is printed on double-weight stock and is in near-fine condition with a 3 in. vertical crease starting at the top right corner and extending downwards, a light 5 in. vertical crease along the bottom portion of the right edge, a 0.25 in. upside-down "v"-shaped tear on the bottom border to the left of center, a 0.5 in. diagonal crease and a 3 in. vertical crease on the bottom corner which extends upwards and a few random areas of wear along the edges. There is no photographer's stamp or markings on the front or verso. Marion was signed on as a Ziegfeld girl in the Ziegfeld Follies of 1916. After making her screen debut in late 1916 in a fashion newsreel, modeling gowns by Lady Duff-Gordon, she appeared in her first feature film in 1917's Runaway Romany. It was a film written by Marion and directed by her brother-in-law, the prominent Broadway producer George W. Lederer. The following year she starred in three films, The Burden of Proof, Beatrice Fairfax, and Cecilia of the Pink Roses. Playing mainly light comedic roles, she quickly became a major movie personality, making a small fortune which enabled her to provide financial assistance for her family and friends. Cecilia of the Pink Roses (1918) was her first film backed by Hearst. She was on her way to being the most famously advertised actress in the world. During the next 10 years she appeared in 29 films, an average of almost three films a year. Hearst loved seeing her in expensive costume pictures, but she also appeared in contemporary comedies like Tillie the Toiler, The Fair Co-Ed (both 1927), and especially two directed by King Vidor, The Patsy and the backstage-in-Hollywood saga Show People (both 1928). The Patsy contains her imitations, that she usually did for friends, of silent stars Lillian Gish, Mae Murray and Pola Negri. After seeing photographs of St Donat's Castle in Country Life magazine, the Welsh Vale of Glamorgan property was bought and revitalised by Hearst in 1925 as a gift to Davies. Hearst and Davies spent much of their time entertaining, holding lavish parties with guests at their Beverly Hills estate. Frequent guests include, among others, Charlie Chaplin, Douglas Fairbanks, and a young John F. Kennedy. George Bernard Shaw, upon visiting St. Donat's, was quoted as saying: "This is what God would have built if he had had the money."